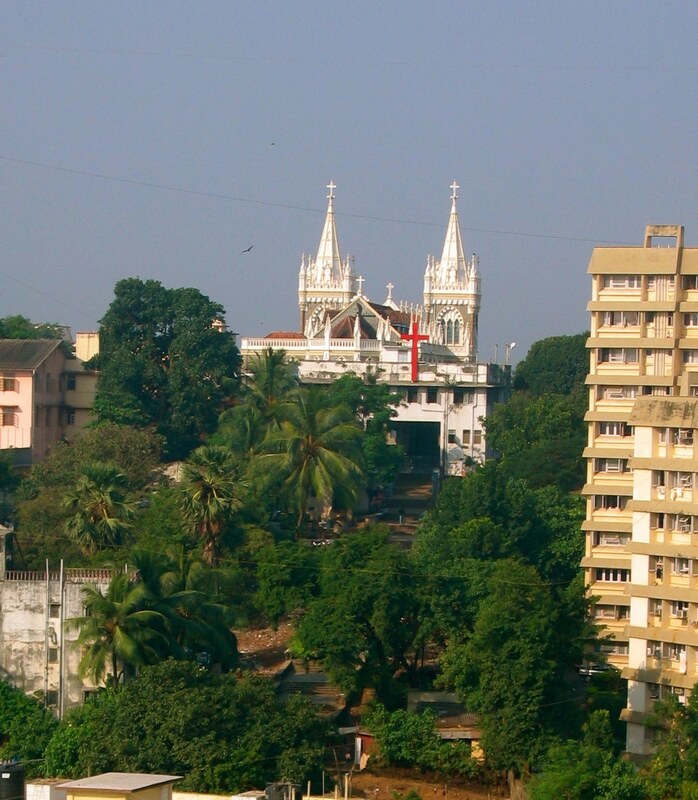 The suburb of Bandra in Mumbai is full of churches. One of the more famous of them is The Basilica of Our Lady of the Mount, more popularly known as Mount Mary’s Church, which, as it’s name suggests, was built on top of a hill, 80 meters above sea level. There are steps that start at the foot of the hill and go all the way up to the church, which is why the area at the bottom of the hill is known as ‘Mount Mary Steps’. Every year, sometime in September, is the Feast of Mount Mary. During this period, a week long fair is held which attracts thousands of people from all over Mumbai. After paying their respects and prayers to Our Lady’s statue, devotees make their way down the steps to enjoy the food and game stalls that line them. For many years we resided in a building situated at ‘Mount Mary Steps’ and, from a small window in our bedroom, we had a great view of the church and the steps which are clearly seen in the picture above. Looking out of that window one evening, was this magical sight. The sky seemed to be on fire. 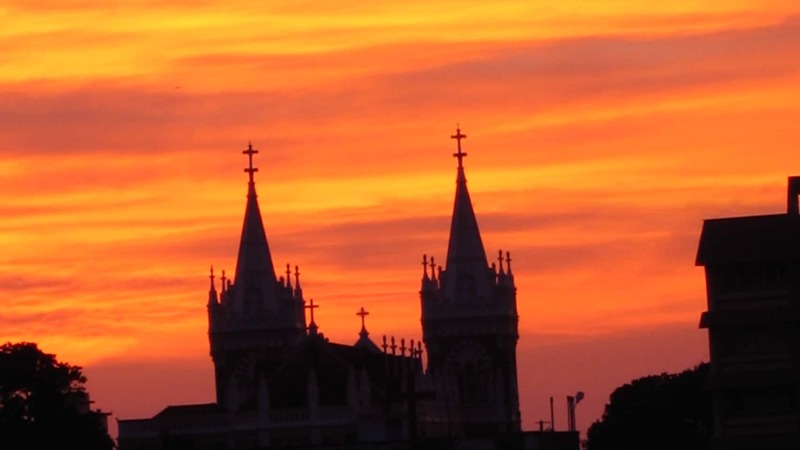 Silhouetted against this blazing background was the Church; its spires reaching high into the heavens. It made a magnificent picture. Guaranteed to bring the even the staunchest of disbelievers down to their knees in prayer! Some of you may notice a difference in two pictures. Mumbai’s skyline is criss-crossed with TV cables that loop from roof to roof forming a truly ugly web above the city. They are visible in the picture on the top. I took the liberty of brushing them away in the second picture as I felt their presence there was close to sacrilege! My ancestors hailed from the village of Calangute in Bardez, Goa; God’s own country as far as I’m concerned! The main village church is St. Alex’s Church which, I believe, was built in the 1700s. It’s not a very big church. But it’s freshly whitewashed walls amidst green palm trees always manages to take my breath away. This particular picture was taken in not-so-happy times. It was taken in the month of May in the year 2007; a month after my father passed away. He was buried here and we had come to Goa for his Month’s Mind Mass. The elaborate facade of the entrance to the cemetery is seen on the left in the picture above. On entering the cemetery there is this long corridor with arches on either side which lead to the graves. It is excellently maintained, and is certainly one of the prettier cemeteries in Goa that I have seen. The beautiful, well preserved, horse drawn hearse definitely adds to the overall ambience. Dad loved Goa and spent as much time here as he could. He built a farmhouse, made predominantly of laterite, (the beautiful red stone seen in many Goa houses), on a hill just outside the village of Calangute. It was his pride and joy. He would passionately supervise the gardens with its lawns and huge variety of flowering plants. His favorite pastime was to take people up there just to show it off! The picture above was taken from the farmhouse. The view from up there is breathtaking. 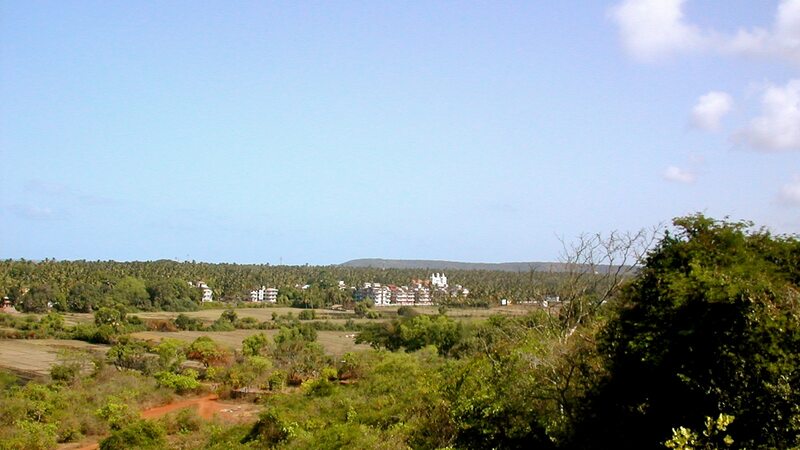 From this high vantage point, one gets a panoramic view of fields, coconut plantations, and the sea beyond. St. Alex’s church is clearly seen in the distance. With a direct view of his beloved property, I don’t think Dad could have asked a better location for his soul to be laid to rest. Lovely! Since I didn’t come to Dad’s funeral or to his memorial meeting (I couldn’t understand why my daughters thought it wiser that I stay at home) I feel I’ve made up for lost times.